As always, please feel free to contact me with any questions. EMP - New offers of the week! I hope you're well and hope you had a great weekend. Promotional text: Funko Pop Whold Cup! Get 20% off when you order 11 Pops! Please remember to update your affiliate ID in the URL link so your activity is tracked! EMP - Week end offer! Terms & Conditions: No minimum order value. Selecte range only. EMP - Next week offer! I hope you're well and hope you had an amazing weekend! We are running an additional +10% off on top of the sales items - this is for a SHORT time only! I hope you're well and hope you had an amazing long bank holiday weekend. Terms & Conditions: Minimum order value £30. Your freebie will be added after entering the code. Only while stocks last. Cannot be used in conjunction with any other promotions. Only valid online for the selected range. Terms & Conditions: Minimum order £80. Customer will get a year’s membership or a year extension. Terms & Conditions: When you spend at least 30€. Only while stocks last. Only valid for the selected range. You can choose your freebie during the order process. EMP - FREE SHIPPING (NO MOV)! Terms & Conditions: No minimum order value. 'If it's not black, put it back :)'! 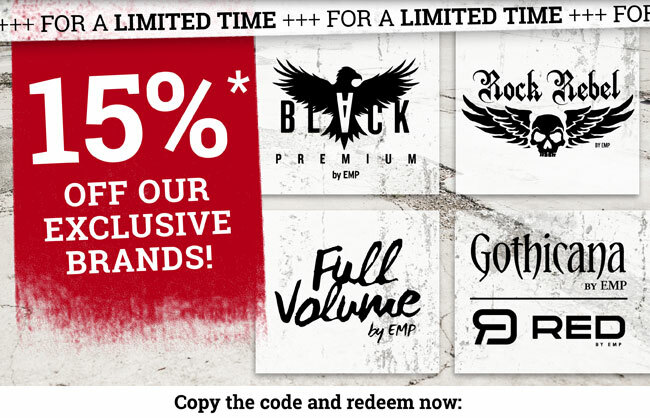 EMP - Flash Sale 48hours ONLY! This offer £5.55 off your order has been performing extremely well and we decided to extend it till today (ending at 11pm). EMP IE - This week offers! We are running a few exciting offers this bank holiday weekend - this is for a SHORT time only! EMP SALE - Get up to 70% off now! Our sales is now up to 70% off instead of 50% off!!! Promotional text: EMP SALE - Get up to 70% off now! Terms & Conditions: Discount will be applied automatically at checkout for customers who buy funkos from the selected range. While stocks last. We are currently running two amazing competitions! 1) In order to qualify as a valid entry, all entries must submit their answer on the EMP competition page. 2) All entrants must enter valid contact information along with their answer. 3) Submissions must be received online via the EMP website competition page by midnight on 22nd May, 23:59. 4) Multiple entries are possible but only one entry per user will be counted as valid. 5) A winner will be randomly selected on the 22nd May 2018. 6) The winner will be notified within 1 working day after the competition closes either by phone or e-mail. 7) If you are not contactable within the time period, EMP reserves the right to select a runner up as the winner. 8) The winner is responsible for their own transport arrangements to and from the event location. 9) The winner is responsible for their own accommodation arrangements. 10) EMP UK will not be held responsible for the right to refuse entry by the event organisers. 11) EMP UK will not be held responsible for any additional costs incurred by the winner as a result of tickets being issued. 12) All entrants must be over 16 years of age and must be resident in the UK & NI. 13) Full details on collection of the tickets will be communicated fully to the winner on or before the 20th April. 14) Full Terms and Conditions can be obtained by e-mailing: emailing mailbox@emp.co.uk. 3) Submissions must be received online via the EMP website competition page by midnight on 8th May at 23:59. 5) A winner will be randomly selected on the 9th May 2018. 10) EMP UK will not be held responsible for right of the event organisers to refuse entry. 12) EMP UK is not deemed responsible for right of admission to the event. 13) All entrants must be over 16 years of age and must be resident in the UK & NI. 14) Full details on collection of the tickets will be communicated fully to the winner on or before the 11th May. 15) Full Terms and Conditions can be obtained by e-mailing: emailing mailbox@emp.co.uk. We are starting an exciting campaign very soon - Sunday! FREE SHIPPING ON ALL ITEMS WITH NO MINIMUM ORDER VALUE! Terms&Conditions: No minimum order value. Limited time only. Affiliate April offers - New! I hope you're well and looking forward to the weekend! Terms & Conditions: Minimum basket value £20.